Condition: Very good. Sufficient margins. Central fold. Verso: blank. Strong impression. Uncommon copper engraving. Map of the southern United States based on Delisle's influential "Carte du Mexique de la Floride…" of 1703. 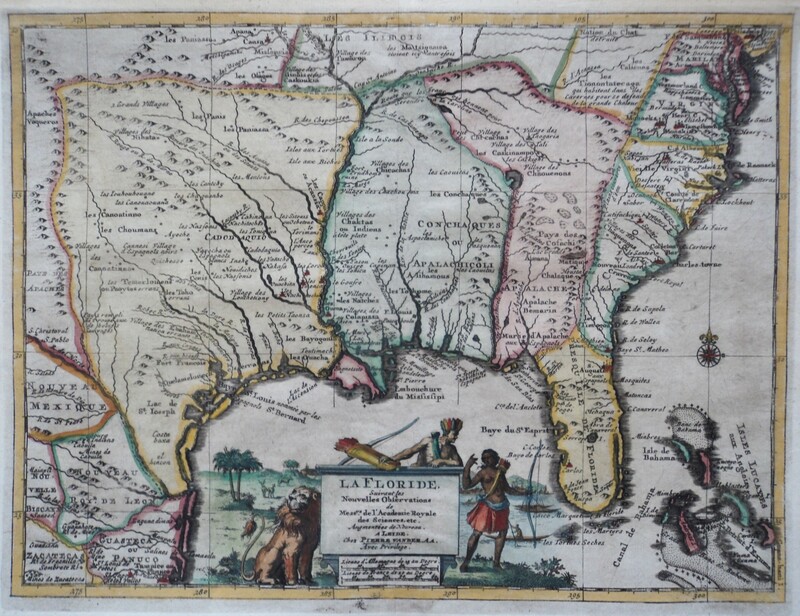 The map is filled with details of early colonial settlements and Indian tribes. A reduced version of the large lake that was first shown on Le Moyne's 1591 map is shown with the label Lac Grande. The Apalachicoli River flows from another large lake in present day western Georgia. Details of the Bahamas are included. The Gulf of Mexico is filled with a large cartouche featuring Native Americas and an incongruent lion.